Daniela adds another fragrant rose to her life’s bouquet celebrating her 18th birthday and first step into adulthood! Daniela is one of the “veterans” of the Saint Andrew’s Centre’s unconventional family of care and love. She was placed in our team’s care back in 2010 and time just flew by unnoticed. Daniela blossomed and thrived at the centre, she became a favourite among our care staff and children alike and she continues to fill our days and hearts with joy every day. But this year is a special one as we realise that our little girl is actually turning into a young lady as she is celebrating her 18th birthday. 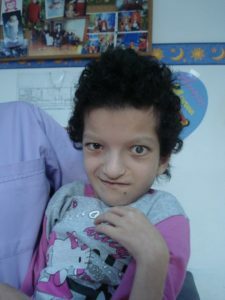 Daniela has a severe diagnosis that impairs her motor and cognitive developments and requires constant and permanent care and assistance from our medical team. Her current cognitive development resembles a child’s who is 1 year old, but she manages to react to stimuli using simple behaviours and interacts in a nonverbal way with adults through simple, basic gestures. Since her admission at the centre, Daniela’s parents told us that they would like to keep in touch with our staff and continue to visit their daughter, as they understood early on the importance of maintaining a healthy-parent child relationship, extremely beneficial for children with special needs. Daniela is one of the fortunate cases as she gets regular visits from her parents and the family enjoy cosy moments together and have nice memories from all the parties and celebrations which took place at the Centre along the years. Daniela’s Dad is her constant companion and the one who likes to visit her often. This week was no different, his first visit of the year carrying presents. Moreover, he brought medication needed for Daniela’s treatment and is usually keen to help and pitch in when needed. Daniela’s Dad is a registered ambulance medical nurse and he thoroughly understands her medical needs and highly praises all the nurses and caregivers who work at Saint Andrew’s and the efforts made along the years to ensure his daughter is comfortable and well-loved. Happy birthday Daniela, may your days shine bright and you continue to have wonderful experiences surrounded by your friends and loved ones!